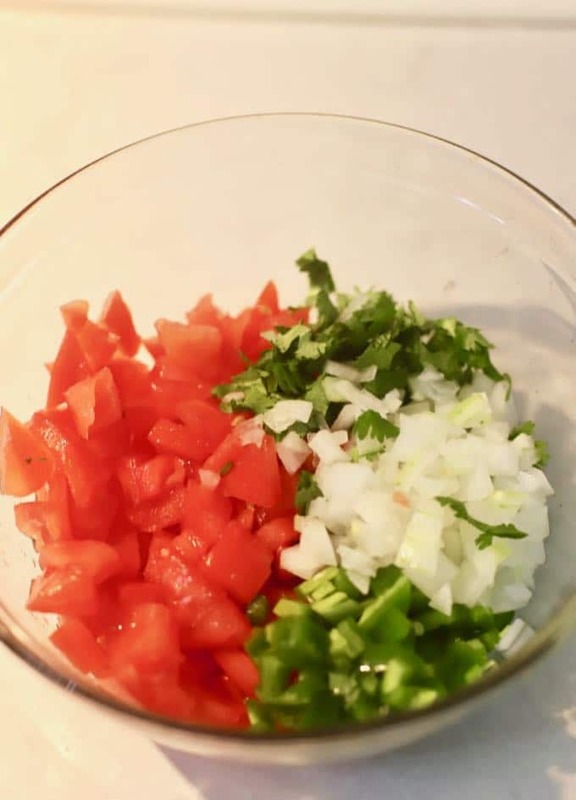 Easy Homemade Pico de Gallo is “muy delicioso,” and if you have the five ingredients, and five minutes to prepare it, you are in business! 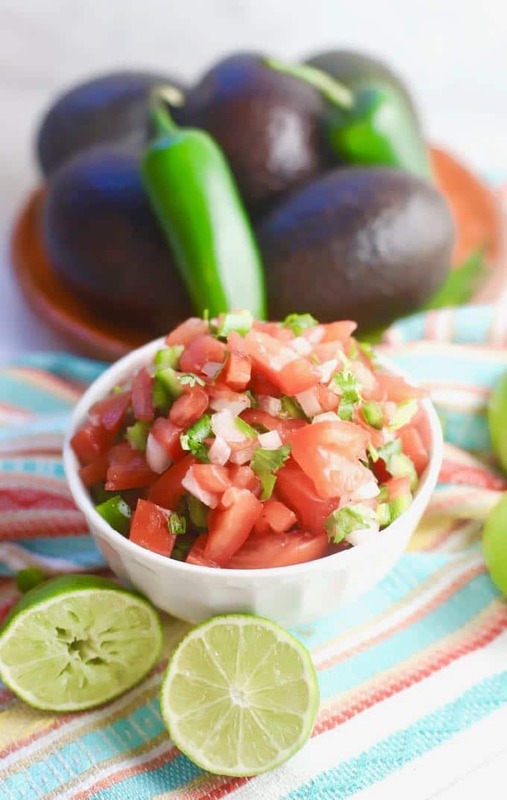 My authentic homemade Pico de Gallo recipe is full of all things good for you including tomatoes, onion, jalapenos, lime juice and cilantro. You can’t go wrong with this Easy Homemade Pico de Gallo, also called Salsa Fresca or Salsa Crudo, whether you are planning a Cinco de Mayo party or just looking for a healthy, gluten-free and low-calorie dip or appetizer. If you are wondering, Pico de Gallo is pronounced “PEE/koh theh GAH/yoh.” Pico means ‘beak’ and ‘gallo’ is Spanish for a ‘rooster’ – so it’s translated as ‘Rooster’s beak.’ According to Wikipedia, Pico de Gallo got its name because originally it was eaten with the thumb and forefinger, and retrieving and eating it resembled the actions of a pecking rooster. You might also be wondering what the difference is between Pico de Gallo and salsa since the ingredients for both are nearly identical. Well, it turns out that the ingredients in salsa are finely diced, and it has more liquid, which makes it soupier. The ingredients for Pico de Gallo, on the other hand, have a larger chop, and it has very little liquid. Whatever you call it, homemade Pico de Gallo is a very versatile condiment and makes a quick, easy, and delicious topping for just about any Mexican or Southwestern food including my Easy Crunchy Taco Cups, Tequila Lime Chicken Enchiladas, Shrimp Tacos with Mango Slaw, and Shrimp and Bacon Quesadillas. It’s also delicious over poultry or fish, and I also always mix Pico de Gallo in with my guacamole and love to add it to salads. 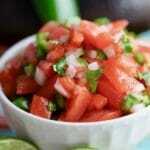 How to make Pico de Gallo! 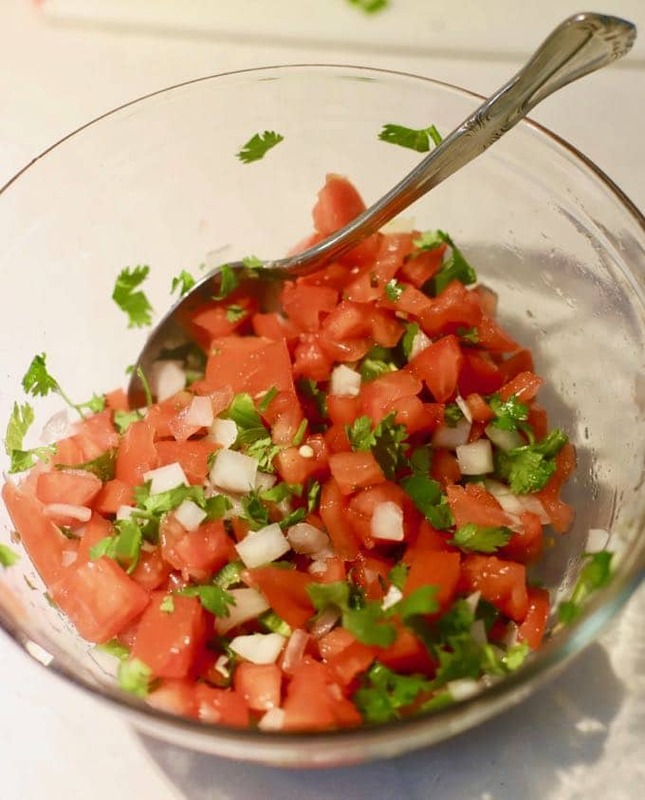 This is the best Pico de Gallo recipe, and the five ingredients I told you about earlier are fresh tomatoes, onion, fresh cilantro (can substitute parsley), fresh lime juice, and fresh jalapenos. To seed, the tomatoes cut them in half horizontally and gently squeeze out the seeds and gelatinous matter surrounding them. Place the chopped tomatoes, onion, cilantro (or parsley), lime juice, and jalapenos (or serrano chilies) in a large bowl. Mix all ingredients. Taste and if needed add a pinch of kosher salt and ground black pepper. Homemade Pico de Gallo can be made up to 48 hours ahead. Cover it and store in the refrigerator until ready to serve. Easy Homemade Pico de Gallo is "muy delicioso" and if you have the five ingredients, and five minutes to prepare it, you are in business! 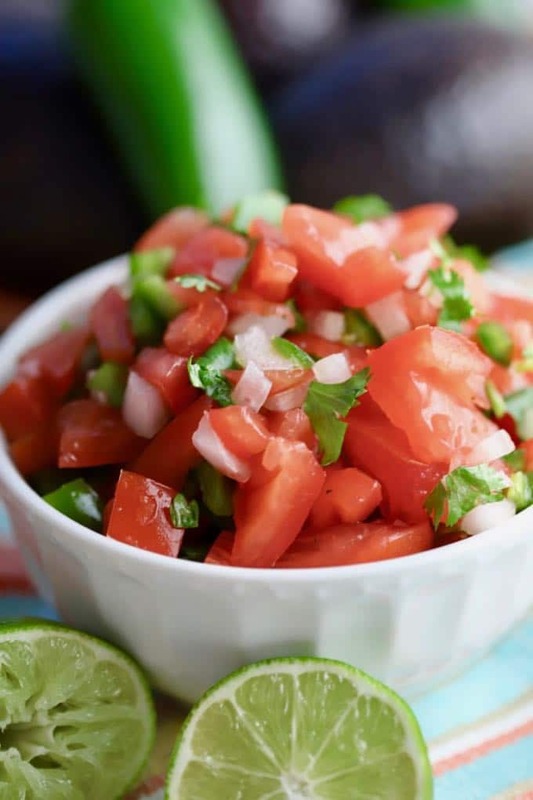 My authentic homemade Pico de Gallo recipe is full of healthy ingredients including tomatoes, onion, jalapenos, lime juice and cilantro and will be a hit at a Cinco de Mayo party. 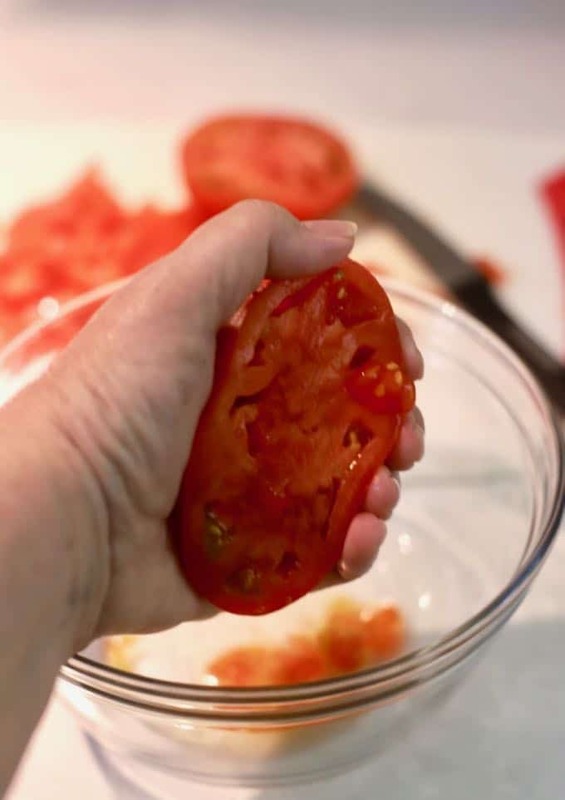 To seed the tomatoes cut them in half horizontally and gently squeeze out the seeds and gelatinous matter surrounding them. Place the chopped tomatoes, onion, cilantro (or parsley), lime juice, and jalapenos (or serrano chilies) in a large bowl and mix well. Taste and add a pinch of kosher salt and ground black pepper if needed. *To seed a jalapeno pepper, slice it lengthwise. Use a small spoon to scrape out the seeds and any membrane. (a grapefruit spoon works great for this). After you chop up the jalapeno, be sure to wash your hands thoroughly and do not touch your eyes because the juice will burn.